Unfortunately, we cannot control getting sick, and no matter how many precautions we take, accidents can still happen while on holiday or overseas business trip. The only think you could do is get informed beforehand and choose the insurance solution that best serves your travelling needs. In this post, we are going to address the importance of travel health insurance plans when going abroad. Namely, we are going to compare the privileges offered to you through your credit card and the ones covered by a travel insurance company. Before planning your trip abroad, it is essential to check coverage types, insurance plans and companies that are meant to take care of you while you are away. Then, you should consider the purpose of your trip, the elements of risks, so that you choose the right travel health insurance provider. There is a difference between visiting a high-risk country and going sightseeing in London or skiing in the Alps, isn’t it? What do you do when you need medical care outside the borders of your country? 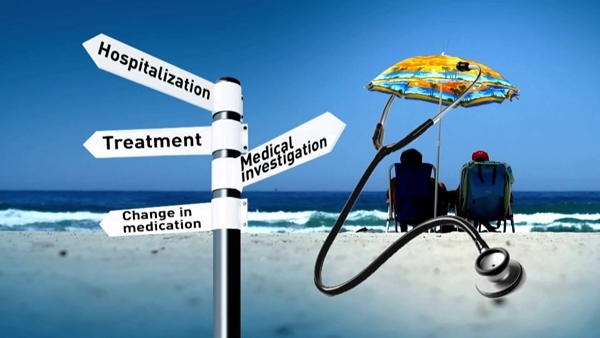 Does your traveler insurance cover your treatment or not? What are the best options out there? Lost or even destroyed baggage. Emergency assistance and concierge services. However, the privileges covered by your credit card (such as Visa Infinite, American Express, World MasterCard) may not reach the level of protection given to you by travel insurance company policies. Why isn’t your credit card enough? First of all, when traveling abroad, you have no international medical nor evacuation coverage. This means that if you have an accident outside the borders of your country and you need medical care, the credit card protection will come in handy with assistance service helping you to arrange the needed care, but no reimbursement will be made. So, all medical expenses will be on you. Your residence country offers you certain privileges that you may find it hard to get someplace else. That is not the case with a proper international medical insurance. We will, therefore, refer to health privileges and insurance plans you can benefit globally. For your peace of mind, please note that there are many international travel health insurance companies that can provide you with solid trip protection plans. Based on consumer reviews, some of the best services are offered by CSA Travel Protection, BUPA, CSA Travel Protection, and TravelSafe Insurance, to name just a few. BUPA, for instance, is an international healthcare group which is currently serving over 22 million customers in over 190 countries. BUPA stands for ‘the British United Provident Association’ and it is a private healthcare company, founded in 1947, even before the NHS ( National Health Service). Among other, it specializes in travel insurances. To make things easier for you and save you all the hassle and time, BUPA has created MembersWorld, which is an exclusive and secure members website. What are the benefits of registering for this service? You do not need to carry documents with you when travelling except your membership card. You can access your documents 24/7 regardless of your location. This must be the best thing about BUPA. If the unexpected happens, it is unfortunate enough. But also worrying about kafka-ish hospitals, lines, strange procedures and documents is not something you need in those situations. BUPA also has a 24/7 Healthline you can call ( +44 (0) 1273 333 9111 ) and guidance will be offered. As regards health privileges, this travel insurance option includes air ambulance transportation, commercial flights, with or without medical escorts, transportation of mortal remains or travel arrangements for relatives and escorts. The Healthline is always open so you can always call if unsure of something. Note that you should always carry your membership card when you contact BUPA representatives so they can confirm if the treatment you are having is covered. Bupa will pay for treatment and conditions included in your plan as long as your membership is valid. Also, they will pay for the treatment suitable for you. Bupa’s ways of paying are either by electronic transfer directly to your bank account or by cheque. It’s advisable to go for the electronic transfer as it is very quick, fuss free and you get paid in whichever currency you have previously chosen. Your plan is an annual contract; your membership is automatically continued every passing year, regardless of you age, or current state of health. You, as the main member, have formed an agreement with your insurer, so only you and your insurer have legal rights under this agreement, this means you are the only one who can enforce the terms and conditions. Do not be fooled. The membership with Bupa consists of an application that you have sent either via telephone or online, and your membership certificate, which shows full details of your insurer. Depending on which plan you choose (with its own price), you benefit from certain services. Always make sure you choose the right plan that is most suitable for you and do not hesitate to ask for help if in doubt. The plans are personalized on your needs. You can opt for a student or singles plan, couples or families or you can choose the senior travellers insurance features. For more information on BUPA, you can visit their global official page: www.bupa-int.com. This is a user-friendly platform where you can find all details needed about international health plans, quotes, and medical facilities worldwide. Was this information useful to you? Are there any other concerns you have as regards your travel insurance options? Feel free to leave your message in the comment section below. We are going to get back to you shortly. Happy traveling!